A visit from good friend Andrew Lauren prompted a revisit to Enlarged Lock 52 and the surrounding area. So on a very cold Sunday morning, we headed out to see what could be seen. Lock 52 is the lock that lies directly alongside the Thruway, and it sits on Thruway property, so it is kind of inaccessible to the public. So I won't say how we got some of the photos we did. Anyhow, don't do as I do; do as I say! So don't say you were not warned. You can be ticketed for trespass! It helps to start with a map, and we are fortunate to have a good map circa 1896.This map shows the lock, drydock, and other neat things to find. Parking at the Erie House on Maiden Lane, we head toward the lock. As we approach the lock, we are on the high side. 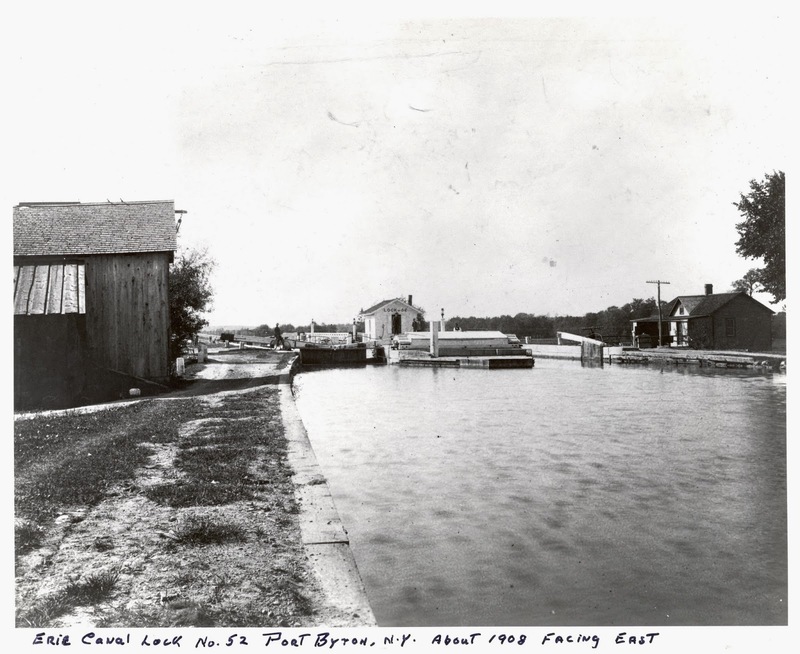 This lock was one of five that stepped down to the west, in this case, the lock is stepping the canal down to the level of the Montezuma (Cayuga) Marsh. 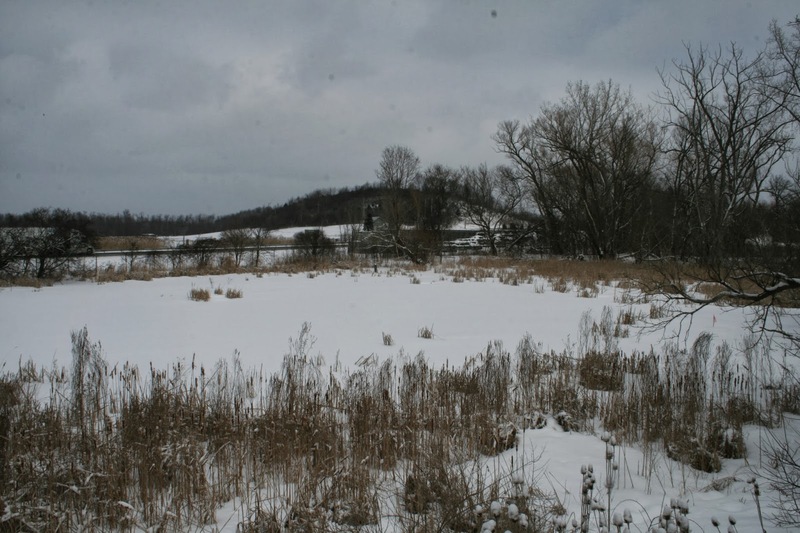 From this point, the canal is level through Montezuma, across the marsh and onto Clyde. 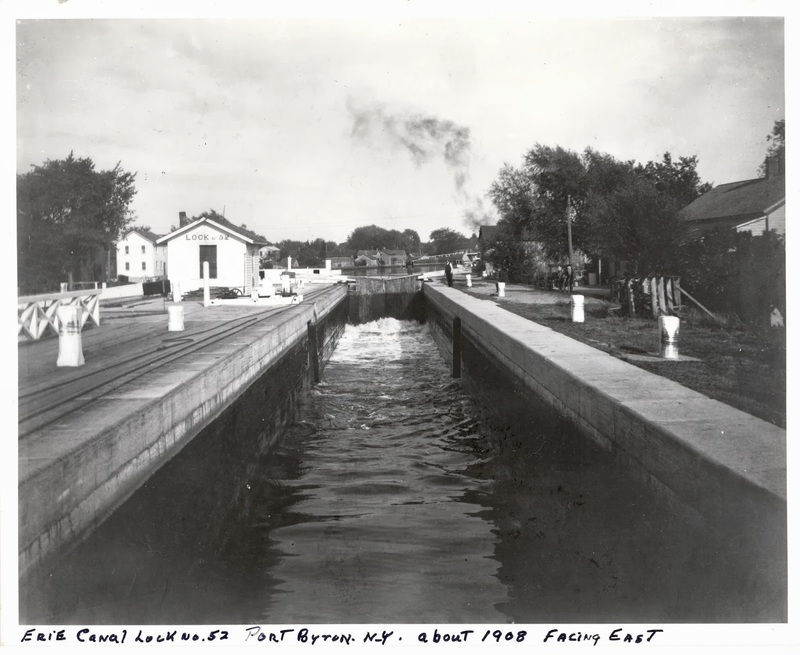 At Lock 53 in Clyde, the canal steps up until it reaches Lake Erie and Buffalo. The reason we have this step down is that Lock 52 sits at the base of a little high spot in the canal. To the east, the canal rises over a small hump, passing through Lock 51 at Jordan. After passing by Camillus, the canal steps down to Syracuse, and then back up another rise until it reaches the Rome level. After Rome, it is all downhill to Albany. So let's get back to the map and the tour. This view is basically the same as the color postcard above. Except all the water, gates, buildings and well, everything is gone and what is left is stone. The three holes in the front show that this is the high end. 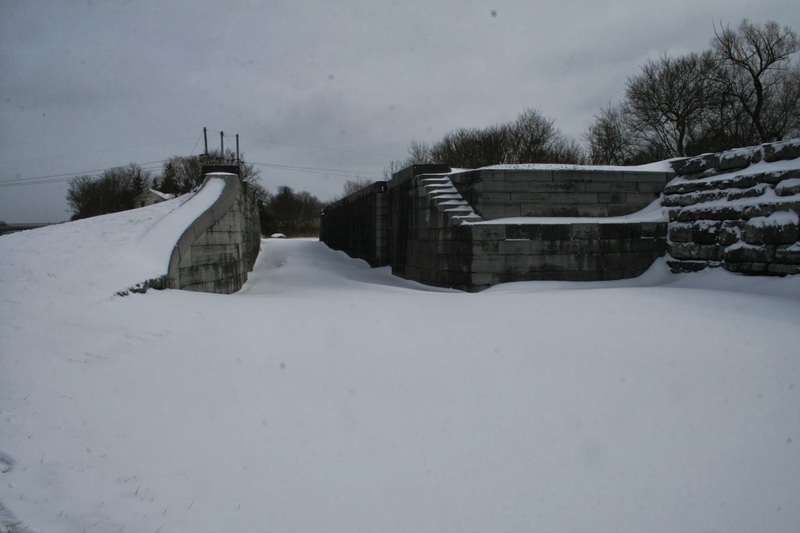 If there was no lockage to use water in the canal, it would overflow through these passages into a tunnel that passes straight through to the far end. These views look into the lower end of the lock. It is difficult to duplicate the postcard view as one would need to stand in the Thruway to shoot it. You can see here the lengthened end and if you have the opportunity to download my guide to Lock 52, you will know that the towpath is on the side away from the lengthened chamber. 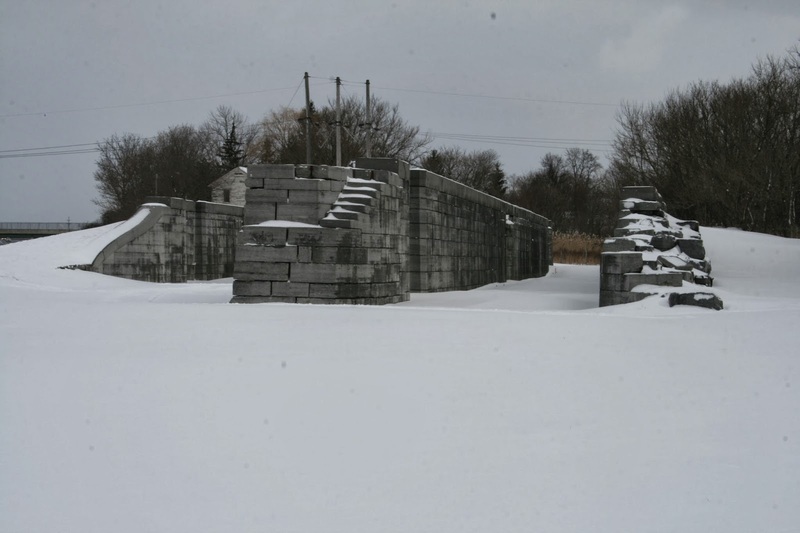 The missing stonework was first thought to be from Thruway construction work, and we know that some stone was removed during the construction of the highway. 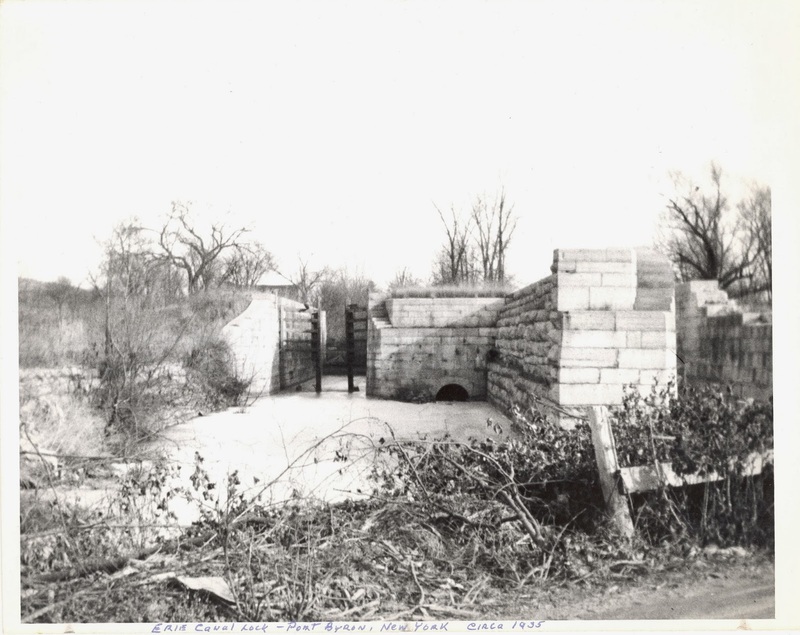 However, this photo shows that stonework was already missing in the 1930's. The road this photo was taken from was in existence on the south side of the canal when the canal was in operation. 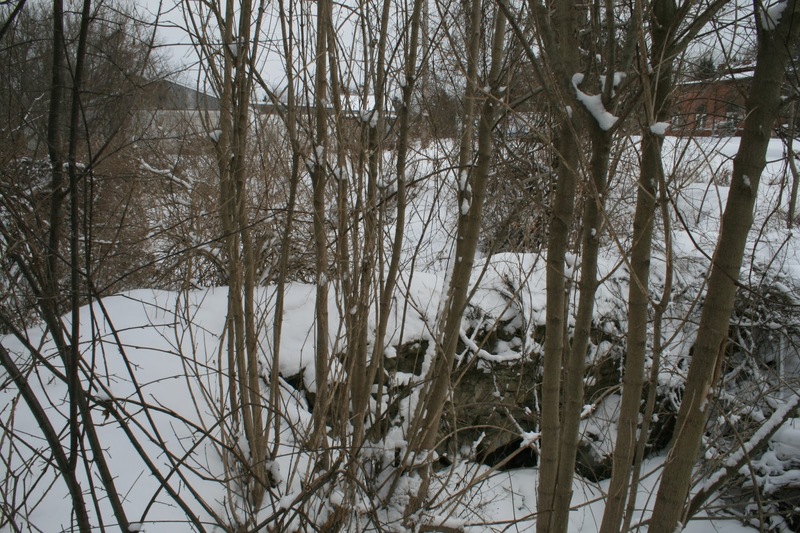 It can be seen on the map except that it appears that the road was pushed across the canal after it was abandoned to allow access to the old towpath on the north side. What is remarkable that all the wood is gone, except for the gates. Someone made use of the wood and started on the stone. You can also see the end of the tunnel. Nowadays, even without the snow, the tunnel is covered by lawn. What I didn't realize is how quickly the land dropped off on both sides of the lock. The lock really sits on the edge of the contour or elevation change and was built out into space with banks formed on both sides. It is clear that soil and land was removed during the construction of the Thruway, but not that much. If you take a look at these photos, you can get a sense that the land did drop off. Why the drop off? Drainage.On the map, you can see the drainage ditch collected water from the wet areas on the south side of the canal and routed it north toward the Seneca River. The map shows the ditch running down both sides of the canal, and the cross under culvert. 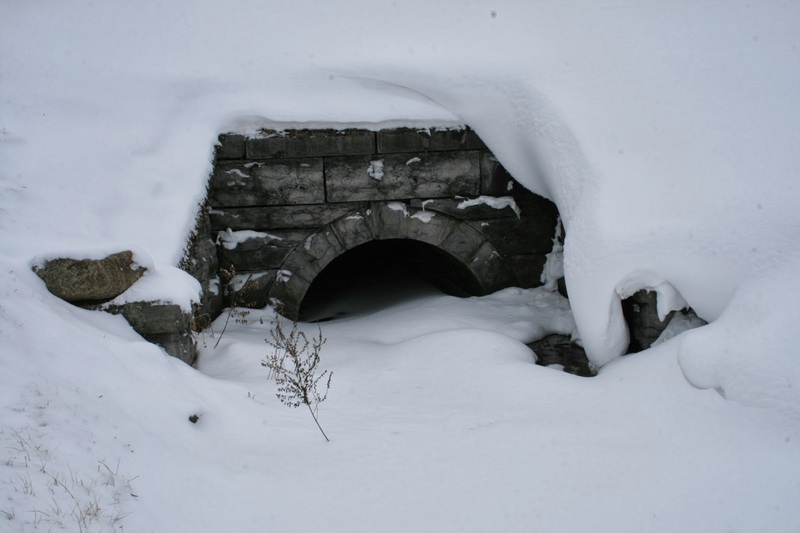 The stonework for the culvert is still in very good shape on both ends. 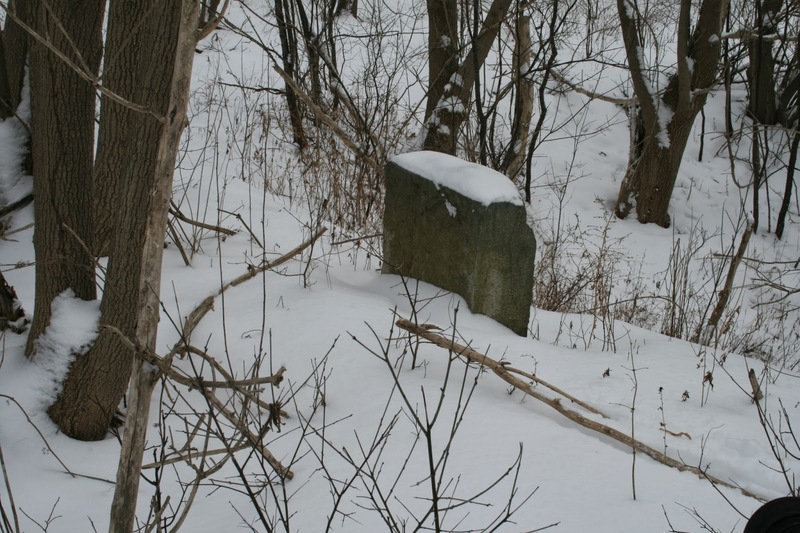 There is even an intact culvert marking stone. 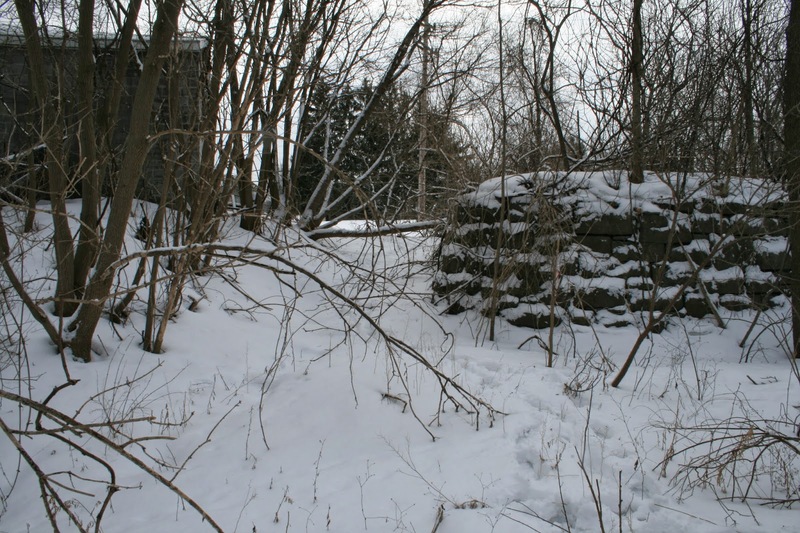 The road on the map crossed over the drainage ditch on a small bridge that is somewhat intact. 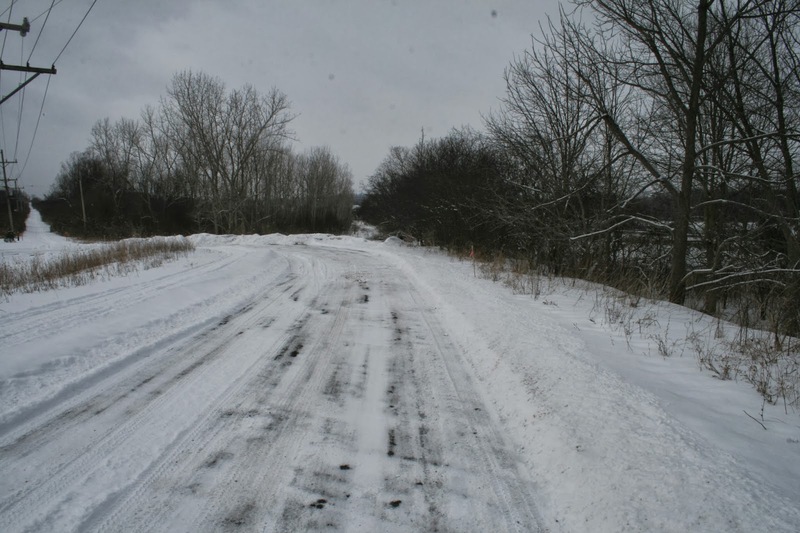 The road is still remarkably intact although I don't know if you would be able to see it in the summer. After walking around the wet area to the southwest, we got this view of the lock and what is called Guidone's Hill, a small drumlin that was cutting off and used as fill during the construction of the Thruway. Another road was constructed during the Thruway building, and it is now known locally as Rooker Drive. It was a temporary entrance to the Thruway from Route 31 for a bit as the Thruway to the east was being finished. You can also see the line of the Rochester, Syracuse and Eastern Trolley going off to the left. The first canal, Clinton's Ditch followed this line also. 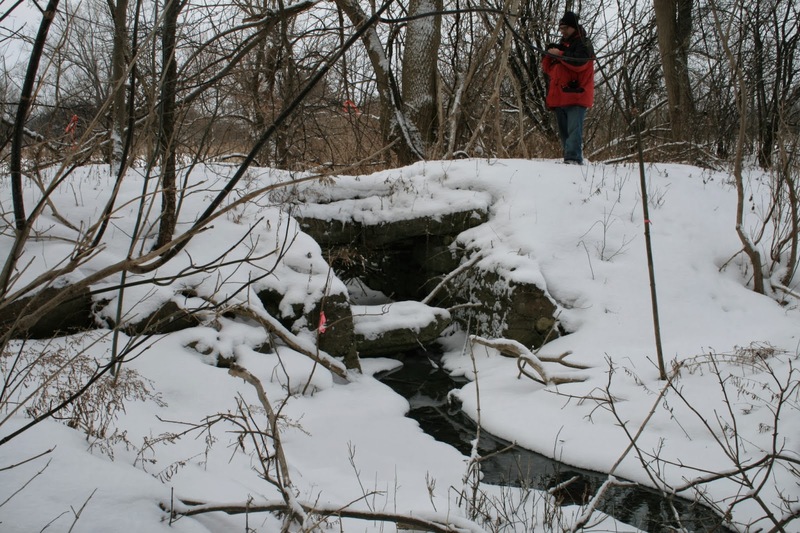 We then headed over to see what could be found of Tanner's Drydock and Clinton's Ditch Lock 60. One chamber of the drydock is fairly visible, as is the drydock entrance. I thought that the first lock was part of this chamber, but I don't quite know anymore. The top map is the same as I posted before, and the second map shows the location of both locks in the 1850's. If you look at the property lines, you will see that the ditches and drydock don't quite line up. But it is close. Stone from the lock may have been used in the construction of the drydock. Here you can just see the stonework and drain for the drydock. The drydock pit is beyond. 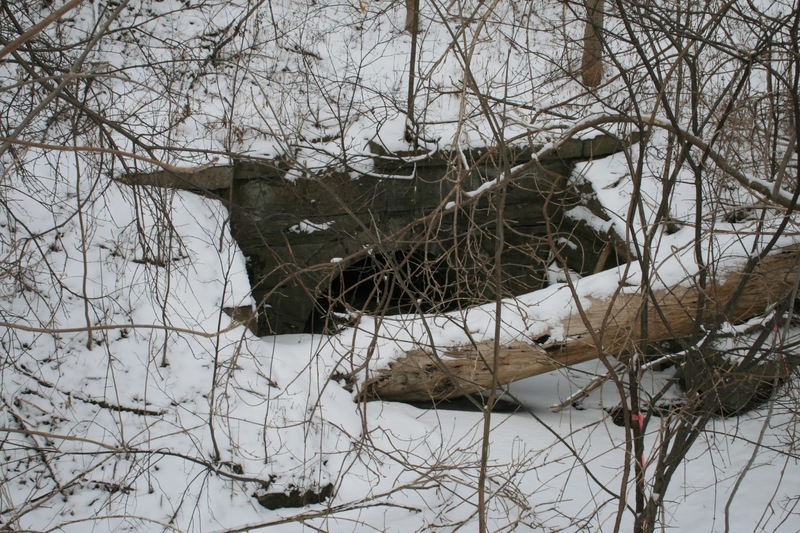 Below is the curved stone entrance as seen from the canal. This is about as close as I could get to duplicating the old photo of the man on the boat. 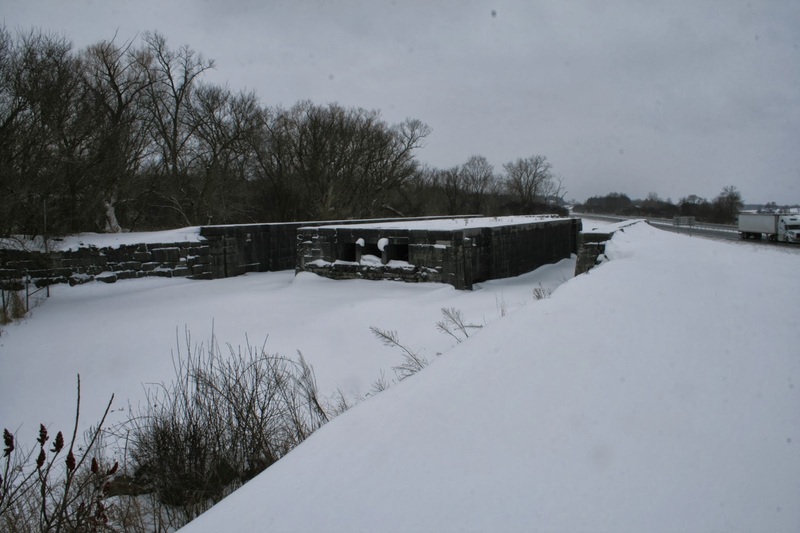 So there you have it, a winter day tour of Lock 52. Is there more of the 1896 map online? The maps, otherwise known as the "Schillner Maps" cover the entire Enlarged Erie. As far as I know, the maps are not available on-line. The maps are about 6 feet long and 2 feet wide. A friend took the time to photograph the maps and make a CD. If you are looking for a certain place, let me know and I can see if I have it. Also, search "Schillner" on the archives website to see if they have been posted. I am looking for just to the right of the map you posted, the Ames property and dry dock, although the dry dock may be gone already by that point. Thanks! I will look online as well! My email is on the profile up on the right. I have lots of maps of the drydock. 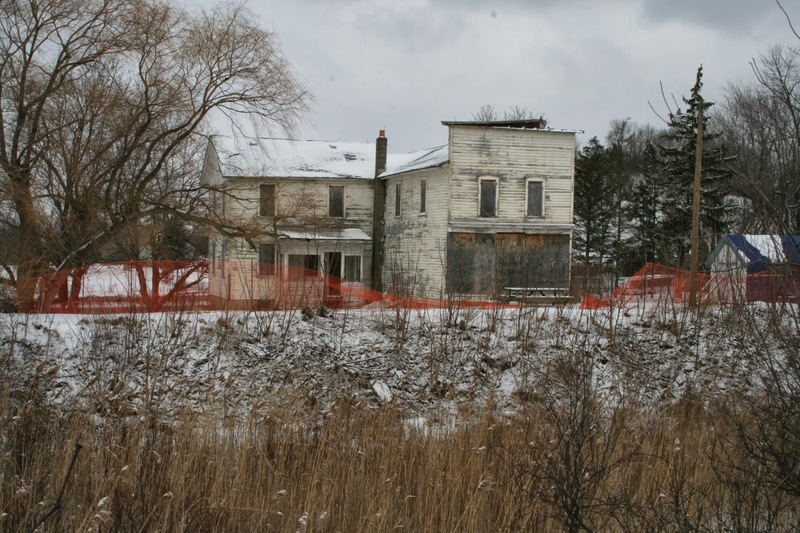 If the property was along the canal, it would be on the maps. There are also Sanborn fire insurance maps that go into the 1930's.